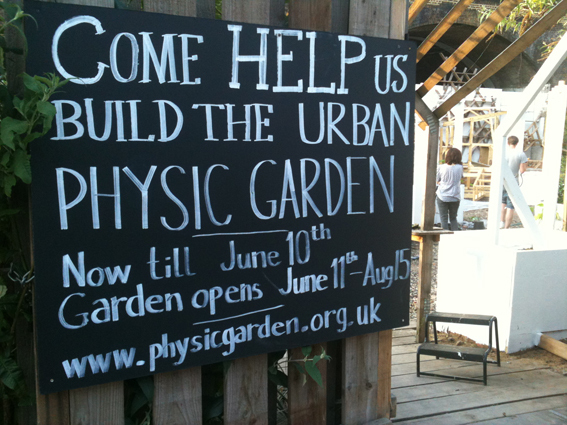 This summer, I have been doing some volunteering work at the fabulous Urban Physic Garden in Southwark. The project is designed and run by Wayward Plants, who I have been following on occasion through their beautiful plant adoption registry. 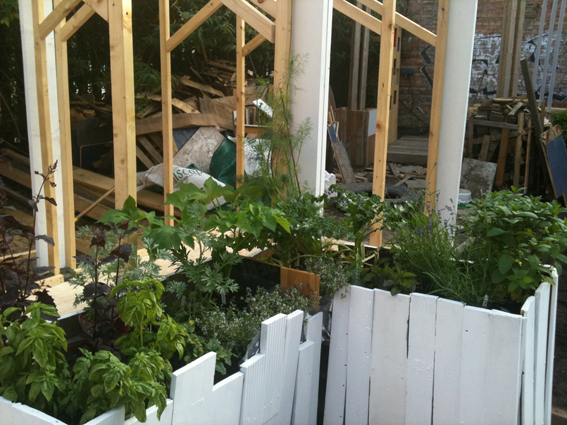 Last year, the team created the Union Street Orchard, and this year on the same piece of land (derelict site, future building plot) at 100 Union Street, Southwark, they created the Physic Garden, a project working with a diversity of makers, architects, gardeners, thriving through its interdependence with volunteers and visitors and clearly engaging with an extraordinary network of people, communities and organisations. I first volunteered in May and spent a really great morning working with another volunteer Nell, building a planter. Wood was being moved around the site into distinctive piles: for planters, a stage, treatment room, incubator, shelves for plants going up for adoption, poison cabinet, cafe seating, and for the firepit. 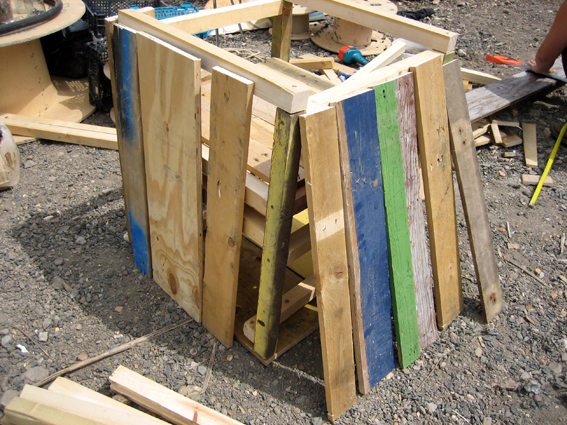 Nell and I spent a good while working out the colour spectrum of the planter using the old wood. On my next visit, I had to paint it white. 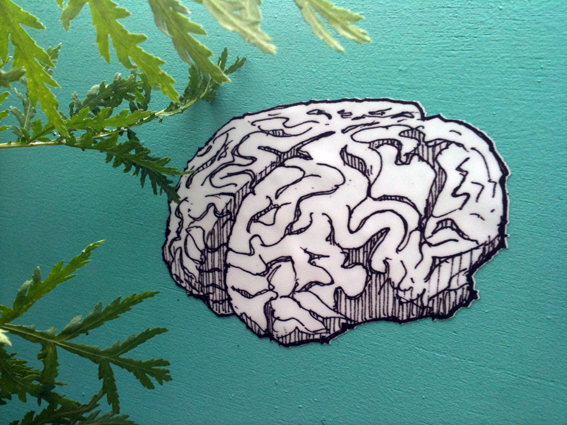 I like that kind of thing – it reminds me of devising – decisions made as they need to be. It’s an interesting thing being a volunteer – arriving at a site, at a project, with no idea what will happen, who you’ll meet. It’s easy to forget the extent to which you muster courage to even cross the threshold – the Physic Garden was a real pleasure to engage with, they managed us as ‘strangers’ so well. 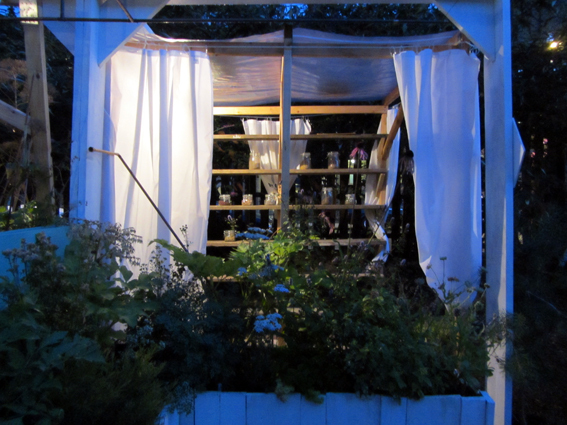 When I returned a few weeks later, the garden was being planted, and I worked with Jarred Henderson from London Harvest, arranging the plants according to the ‘physic’ sections, to their healing properties. Some truly inspiring days, organising the planters and having so much practical and thoughtful contact with such a wonderful diversity of plants – some very familiar to me, others a mystery, and seeing them fall into their groupings, their relationship with our human body – how plant cells and human cells might help each other. Tonic. 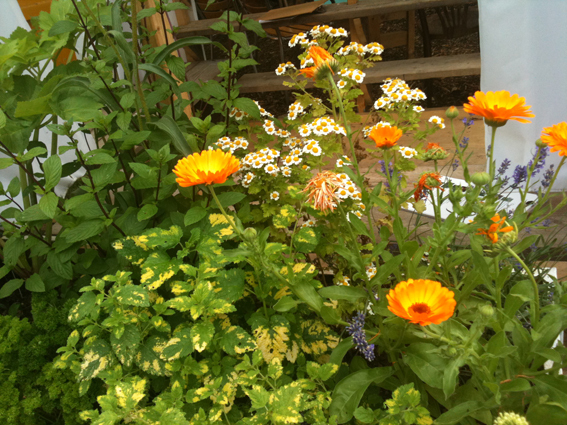 The singular bright orange of Calendula, variegated Lemon Balm, Chicory, all the Sages, the Parsleys, Mints, Nettle …. 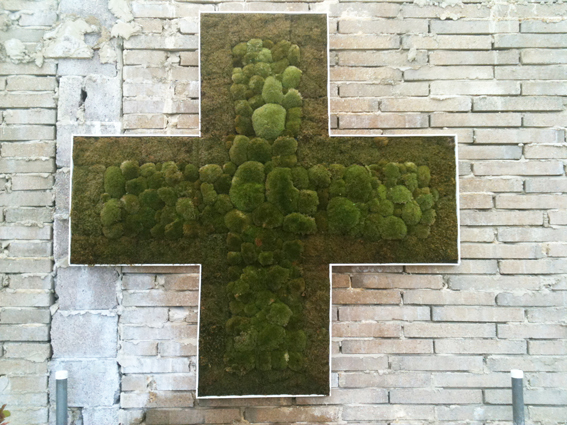 The Garden was organised into ‘wards’ – oncology, psychiatry, gynecology, respiratory etc, with diagrams and lists of connected plants. Here they all are! You can also see beneath each ‘ward’ who adopted it! The garden opened in mid June and closed in mid August, with hundreds of visitors passing through each day, to visit the garden, and participate in walks, study, workshops and arts events. I went on one: Peter Houghton from Kings College walked us from the Physic Garden past the herb garden at the side of Southwark Cathedral and into the Life Sciences Museum of Kings College where he talked about how plants get made into pills via the (essential, lucrative, mysterious) pharmaceutical industry. Peter’s tour reminded me how monasteries and abbeys had been so important in relation to maintaining herb gardens – I know this from Glastonbury – and to see the herb garden next to Southwark with its abundant Feverfew, poppies, lavender and sage, I thought about the ironies of this – the nature and extent of the damage wreaked by Christianity over the centuries, in relationship to our connectivity with herbs and plants for healing and repair. And how we forget that so many familiar plants form the basis of so many medicines, just as we forget about our how we can achieve a very practical everyday relationship with plants that can help us, plant ‘friends’ that can live just outside the back door. 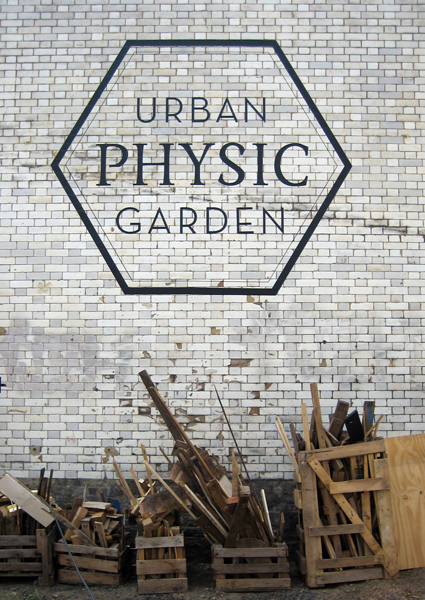 The Urban Physic Garden has done so much this summer, both for me and I’m sure, for so many of the people who came through the door – an incredible space full of the excellent architecture and design, with the brilliance of plants and their extraordinary capacity to restore and connect. And there was an eclectic and inspiring programme of events, and I haven’t even got onto Loowat’s Biogister or the Rambulance Cafe yet ….. Thank you Heather, Jarred and Tom…. 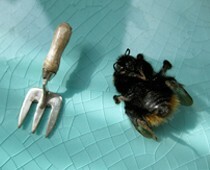 A great short film about the garden by Monocle amongst other international urban farm projects.